There's been a mixed reaction about Outside Lands and while my blog used to be the hotbed of controversy when the event had its first year, The Richmond District Blog of San Francisco got over 170 comments, and it was pretty heated. There's a handful that says, it was fine, others argued it wasn't fun because the noise was so bad. Even one of my friends who lives in University Park North (a.k.a. Stonestown Apartments) could hear the bass, and that's a far distance away from the park. As for me, life wasn't so bad in the Outer Richmond. Last year, I could hear some of the bass rumbling my walls and my ears, but this year, I didn't hear anything. That's a little odd, or maybe it's because the stage and speakers on the Polo Fields was facing east instead of west. I did notice some sound when I was on Geary and 19th walking around having some Joe's ice cream, but I surely didn't hear any music when I was inside earlier having curry at Volcano. Traffic wasn't that bad to go north and south. There was some rumor mill that Great Highway was closed all weekend, but that wasn't true at all. I took my car on Friday and traveled along Great Highway in the morning without any difficulties. Going back around 6PM was a little troubling with heavy traffic between Lincoln and Fulton, but this was normal traffic people would expect on a weekend during a gorgeous day (those who wants to enjoy a day at the beach). On Saturday, I decided to go out for an evening at the movies. Things went quite smoothly because I left my house at about 8PM and returned around 11:15PM encountering no traffic; only just a few stragglers walking around for a bus stop. I'd have to say that Muni was my only major complaint for this entire event. I took the 38L inbound with no difficulties to reach Japantown for the Nihonmachi Street Fair. Going back was a total hellhole. I just missed the 38L and looked at the Nextbus sign for the next vehicle. It said the next limited bus would be nearly 25 minutes. I waited and waited while four 38 local buses passed by, each one packed to the maximum capacity. I finally hopped onto a limited bus for a horrendous bus ride to Arguello to stop at the bank. I then had to wait for the next limited... the next one was packed, and so was the next few local buses. Muni had a bunch of out of service 60 foot articulated buses just buzzing by, and finally had to force my way on the next limited bus just so I could get home. I knew most of the passengers on the bus was Outside Landers because they wore a green wristband, and a huge wad of them got off at 25th and 33rd Avenues. I'm curious of why they took the Geary lines. More direct service is provided by the N-Judah, 71-Height Noriega, and 5-Fulton. I knew Outside Lands rented the Bill Graham Civic Auditorium, but it looks like a lot of people went cheap and didn't opt for the express shuttle service. What's strange is the Geary lines are much further away from the Civic Auditorium at Civic Center than the other lines people can take that goes closest to the site in Golden Gate Park. What did you think of Outside Lands? Leave a comment. 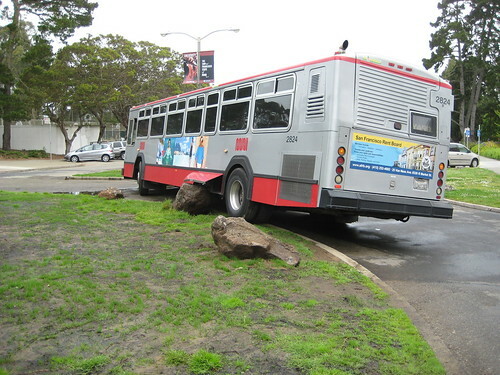 Lastly, regarding the photo, I couldn't find anything amusing to use, so I used a Muni training bus accident photo. The N Judah was not great for locals. I used the outbound N from Powell and Civic Center Saturday and Sunday respectively and both times they turned around at Sunset. I am not sure whether any went down to Ocean Beach. I have mixed feelings about it. On one hand the street closures were pretty annoying and improperly announced. But then again, they are also giving Rec-Park a bunch of money. They did keep some areas open. When they meant streets closed to public, they meant autos only. Bikes and pedestrians were still allowed through the gates. At the same time, there were hundreds of cars parked inside so I'm not sure what was going on there. Did they sell parking? I heard about the Great Highway closure also, but my source said that it was only Sunday only. I did not go verify though. The next closure of the Great Highway is on Sunday the 21st. I believe it's the Nike marathon. I live far enough away that I didn't hear the bands but I did have groups of people stumbling around my neighborhood, making all kinds of racket between 2-4 AM. I know that Park and Rec got a ton of money but does anybody know what the clean up will cost? I live on 40th Avenue north of the park by Geary. Last year(2010), I could hear outside lands ONLY on Friday. Nothing on saturday or sunday. This year it was loud the whole time through. As a former union stagehand, I can attest that sound technicians are notorious for doing things their way - they want to put their own stamp on the sound, not follow how someone did it the year before. This was in evidence to me this time. Bus-wise, crowds did not affect my use of the 38 and I didnt try the 5fulton so I cant speak to that. As a regular GG Park user, the big impact is during the two weeks before the concert when they begin fencing off JFK Drive paths. Again, as an experienced stagehand, the inner fencing to protect their equipment could be done first and leave the outer layers that close off trails for last. They do it backwards and there's no logistical reason for it. Muni provided extra service on the 5, 71 and N lines.